The weather is getting warmer (at least in California), so you want to stay cool and refreshed. And as fun as it is to get in the water at the pool or the beach, let's face it--you can't always do that at places like work or church. That's when I found out about Evian Facial Spray. It's a spray that is meant to set makeup, cool and refresh your skin, and so much more. It's made up of Evian water and is sealed in a canister so that it cannot be contaminated by outside sources. It's basically your own personal mister, and you can use it at the gym, at the work, or at the beach. I tried it out for myself and misted myself to see how it would be with my makeup. I already had my makeup on for a few hours and wanted to see if it could help it last longer and keep me looking and feeling fresh. After eating Korean bbq where I had smoke from the grill coming at my face on top of the hot weather and a total of 10 hours later, my makeup looked pretty fresh still. I didn't have my eye makeup on due to rubbing my eyes a few minutes earlier but my foundation was still in tact, which does not happen often with me. My only thing with the Evian Facial Spray was that a few minutes after it dried there was a weird feeling on my face, almost as if I was wearing a facial mask. The feeling didn't last long, however, which was good. As I was trying this out for myself, the boyfriend was also trying it out for himself as well... as well as all of our other friends. He definitely loves it! And I like it too and recommend it for keeping cool but also helping set your makeup. I'll try it again soon and replace my setting powder and see how it does on its own. Would you use a personal mister like this? Do you use mists instead of setting powder for your makeup? 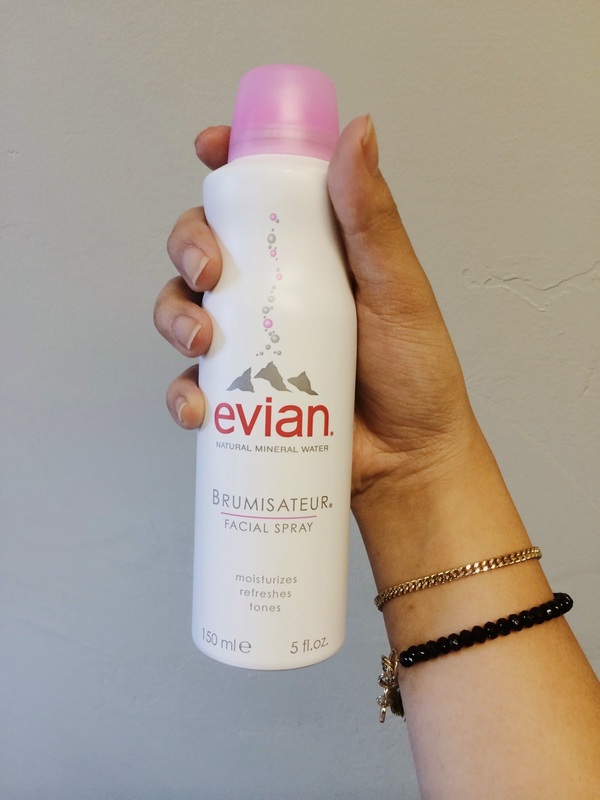 Disclosure: I was provided this Evian Facial Spray courtesy of Evian and Brandbacker. All opinions are my own. I've never tried a water mister, but I really like Boot's Botanics Rosewater spray. I use it as a toner in the morning, or midday if I'm not wearing makeup and need a refresher. I occasionally use the ELF Mist & Set as a setting spray, though!